System operacyjny (OS) kontroluje praktycznie wszystkie funkcje komputera. Kurs odnosi się do terminologii i zagadnień związanych z systemami Windows 2000 oraz Windows XP. Slide 5 - The Purpose of an Operating System 5.0 Chapter Introduction The operating system controls almost all functions on a computer. In this chapter, students will learn about the components, functions, and terminology related to the Windows 2000 and Windows XP operating systems. After completing this chapter, students will meet these objectives: Explain the purpose of an operating system. Describe and compare operating systems to include purpose, limitations, and compatibilities. Determine the operating system based on customer needs. Install an operating system. Navigate a GUI. Identify and apply common preventive maintenance techniques for operating systems. Troubleshoot operating systems. Wszystkie komputery opierają swoja pracę na systemach operacyjnych, które dostarczają interfejs, obsługę sprzętu i aplikacji. System operacyjny uruchamia komputer i zarządza systemem plików. Praktycznie wszystkie współczesne systemy operacyjne wspierają więcej niż jednego użytkownika, procesor lub zadanie. Cztery podstawowe role systemu operacyjnego: Kontrola dostępu do sprzętu Zarządzanie plikami i folderami Dostarczanie interfejsu Zarządzanie aplikacjami Slide 6 - Roles of an Operating System 5.1 Explain the purpose of an operating system All computers rely on an operating system (OS) to provide the interface for interaction between users, applications, and hardware. The operating system boots the computer and manages the file system. Almost all modern operating systems can support more than one user, task, or CPU. The operating system has four main roles: Control hardware access Manage files and folders Provide a user interface Manage applications After completing this section, the students will meet these objectives: Describe characteristics of modern operating systems Explain operating system concepts Teaching Strategy: An operating system is a software program that provides an interface between the user and the computer, and manages thousands of applications. Command Line Interface (CLI): Użytkownik wprowadza komendy tekstowo Graphical User Interface (GUI): użytkownik używa menu oraz okien. Slide 8 – User Interface 5.1.1 Describe characteristics of modern operating systems The operating system enables the user to interact with software and hardware. There are two types of user interfaces: Command Line Interface (CLI) – The user types commands at a prompt. Graphical User Interface (GUI) – The user interacts with menus and icons. Most operating systems, such as Windows 2000 and Windows XP, include both a GUI and a CLI. Większość systemów dostarcza zarówno GUI oraz CLI. Terminologia wykorzystywana przy porównaniu systemów: Wieloużytkownikowość – dwóch lub więcej użytkowników może pracować, dzielić urządzenia i peryferia w jednym czasie. Wielozadaniowość – Komputer obsługuje wiele aplikacji w jednym czasie. Obsługa wielu procesorów – obsługa komputerów wyposażonych w wiele CPU. Obsługa wielu wątków – Program może być podzielony na wiele mniejszych części zwanych wątkami.. Slide 9 – Compare Operating Systems 5.1.2 Explain operating system concepts To understand the capabilities of an operating system, it is important to understand some basic terms. The following terms are often used when comparing operating systems: Multi-user – Two or more users can work with programs and share peripheral devices, such as printers, at the same time. Multi-tasking – The computer is capable of operating multiple applications at the same time. Multi-processing – The computer can have two or more central processing units (CPUs) that programs share. Multi-threading – A program can be broken into smaller parts that can be loaded as needed by the operating system. Multi-threading allows individual programs to be multi-tasked. Almost all modern operating systems are multi-user and multi-tasking, and they support multi-processing and multi-threading. 8 Tryb chroniony Ma dostęp do całej pamięci. System biurowy System sieciowy Wspiera jednego użytkownika Wspiera aplikacje jednostanowiskowe Dzieli pliki i foldery Dzieli peryferia Wykorzystywany w małych sieciach Wspiera wielu użytkowników Wspiera aplikacje wielostanowiskowe Wprowadza redundancję Zwiększa bezpieczeństwo Wykorzystuje sieć Slide 13 - Compare Operating Systems 5.2 Describe and compare operating systems to include purpose, limitations, and compatibilities A technician may be asked to choose and install an operating system for a customer. The type of OS selected depends on the customer's requirements for the computer. There are two distinct types of operating systems: desktop operating systems and network operating systems. A desktop operating system is intended for use in a small office/home office (SOHO) with a limited number of users. A network operating system (NOS) is designed for a corporate environment serving multiple users with a wide range of needs. After completing this section, students will meet these objectives: Describe desktop operating systems. Describe network operating systems. Systemy typu desktop: Microsoft Windows: Windows XP Macintosh: Mac OS X Linux: Fedora, Ubuntu itp. Charakterystyka: Wspiera jednego użytkownika Wspiera aplikacje jednostanowiskowe Dzieli pliki i foldery w małej sieci Slide 12 - Compare Operating Systems 5.2.1 Describe operating systems In the current software market, the most commonly used desktop operating systems fall into four groups: Microsoft Windows: Windows XP Macintosh: Mac OS X Linux: Fedora, Ubuntu, and others UNIX Operating systems have several similarities: GUI interface Standard "look and feel" characteristics Multithreading capabilities Multitasking capabilities Ability to function with most hardware The differences between desktop operating systems are typically related to availability and how much can be accomplished using the GUI: Windows and MAC OS users can perform the majority of tasks through the GUI. Linux and UNIX users must understand and use the CLI to perform some tasks. The code for an operating system will be either open source or proprietary: Open source applications can be read and modified. There are few restrictions on downloading, using, or rewriting open source software. Programmers openly share code with other programmers. Linux distributions are open source. Proprietary applications cannot be read or modified. Proprietary software agreements restrict the use of the software, identifying where and when the software may be used. Microsoft Windows products are proprietary. Typowy sieciowy system operacyjny: Novell Netware Microsoft Windows Server Linux UNIX Charakterystyka: Wspiera wielu użytkowników Wspiera aplikacje wielostanowiskowe Wprowadza zwiększone bezpieczeństwo Slide 15 - Network Operating Systems (NOS) 5.2.2 Describe network operating systems A network OS has the following characteristics: Supports multiple users Runs multi-user applications Is robust and redundant Provides increased security compared to desktop operating systems These are the most common network operating systems: Microsoft Windows – Network operating systems offered by Microsoft are Windows 2000 Server and Windows Server Windows Server operating systems use a central database called Active Directory to manage network resources. Novell Netware – Novell NetWare was the first OS to meet network OS requirements and enjoy widespread deployment in PC-based LANs back in the 1980s. Linux – Linux operating systems include Red Hat, Caldera, SuSE, Debian, and Slackware. UNIX – Various corporations offered proprietary operating systems, based on UNIX Student Activity: The student course content includes worksheet, NOS Certifications and Jobs. To complete this worksheet, students will conduct research for three different network operating system certifications. Record the details of each, including Network Operating Systems covered, certification titles, and courses and/or training required to earn certification. Then the students will conduct research for at least two network jobs available in your area. 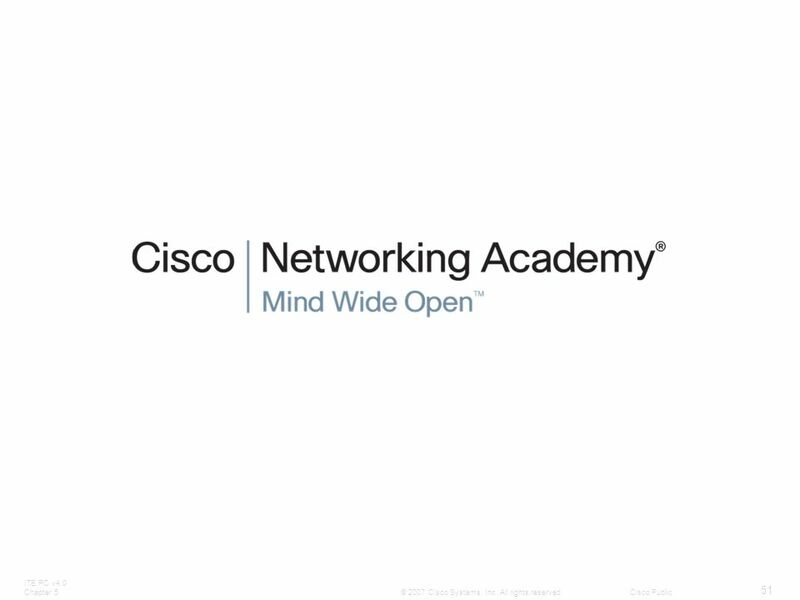 Describe the network jobs and the required certifications needed for the position. Which job would you prefer? List reasons for your selection. Przetwarzanie tekstu, arkusze kalkulacyjne itp. Aplikacje graficzne Photoshop lub Illustrator Tworzenie animacji Flash Aplikacje biznesowe Księgowość, zarządzanie kontaktami, sprzedażą Slide 17 – What Does Your Customer Require? 5.3.1 Identify applications and environments that are compatible with an operating system An operating system should be compatible with all applications that are installed on a computer. Before recommending an OS to your customer, investigate the types of applications that your customer will be using. If the computer will be part of a network, the operating system must also be compatible with the operating systems of the other computers in the network. The network type determines what operating systems are compatible. Microsoft Windows networks can have multiple computers using different versions of Microsoft operating systems. These are some guidelines that will help you determine the best operating system for your customer: Does the computer have “off-the-shelf” applications or customized applications that were programmed specifically for this customer? If the customer will be using a customized application, the programmer of that application will specify which operating system is compatible with it. Most off-the-shelf applications specify a list of compatible operating systems on the outside of the application package. Are the applications programmed for a single user or multiple users? This information will help you decide whether to recommend a desktop OS or a network OS. If the computer will be connected to a network, make sure to recommend the same OS platform that the other computers on the network use. Are any data files shared with other computers, such as a laptop or home computer? To ensure compatibility of file formats, recommend the same OS platform that the other data file-sharing computers use. As an example, your customer may have a Windows network installed and wants to add more computers to the network. In this case, you should recommend a Windows OS for the new computers. If the customer does not have any existing computer equipment, the choice of available OS platforms increases. To make an OS recommendation, you will need to review budget constraints, learn how the computer will be used, and determine what types of applications will be installed. Klienci czasem będą musieli zmodernizować lub zakupić nowy sprzęt, aby spełnić wymagania systemu.. Analiza kosztów wskaże czy zakup jest lepszym wyborem od modernizacji. Typowa modernizacja: RAM Dysk twardy Procesor Karta graficzna Slide 18 - Identify Minimum Hardware Requirements 5.3.2 Determine minimum hardware requirements and compatibility with the OS platform Operating systems have minimum hardware requirements that must be met for the OS to install and function correctly. Identify the equipment that your customer has in place. If hardware upgrades are necessary to meet the minimum requirements for an OS, conduct a cost analysis to determine the best course of action. In some cases, it may be less expensive for the customer to purchase a new computer than to upgrade the current system. In other cases, it may be cost-effective to upgrade one or more of the following components: RAM Hard disk drive CPU Video adapter card NOTE: In some cases, the application requirements may exceed the hardware requirements of the operating system. For the application to function properly, it will be necessary to satisfy the additional requirements. Once you have determined the minimum hardware requirements for an OS, you should ensure that all of the hardware in the computer is compatible with the operating system that you have selected for your customer. Większość systemów ma listę HCL. Listy można odnaleźć na stronach producentów. Lista HCL zawiera sprzęt, który bezproblemowo działa z systemem operacyjnym Slide 19 - Hardware Compatibility List (HCL) 5.3.2 Determine minimum hardware requirements and compatibility with the OS platform Most operating systems have a hardware compatibility list (HCL) that can be found on the manufacturer's website. These lists provide a detailed inventory of hardware that has been tested and is known to work with the operating system. If any of your customer’s existing hardware is not on the list, those components may need to be upgraded to match components on the HCL. NOTE: An HCL may not be continuously maintained and therefore may not be a comprehensive reference. Student Activity: The student course content includes the worksheet, Upgrade Components. To complete this worksheet, students will conduct research for specified hardware components including RAM, hard disk drive, and video adapter card. Find the details of at least two of each component specified including brand name, model number, features, and cost. Recommend one of each for purchase. Pierwsza część instalacji zajmuje się przygotowaniem dysku twardego: partycjonowanie i formatowanie. Druga cześć przygotowuje dysk do akceptowania danych. System plików zapewnia strukturę katalogów dla plików aplikacji, użytkownika i plików systemowych,. Przykłady systemu plików: FAT32 NTFS Slide 21 - Prepare the Disk 5.4.2 Prepare disk One of the advantages of an operating system such as Windows XP is that it can be installed quickly and easily. The first portion of the installation process deals with formatting and partitioning the hard drive. This prepares the disk to accept the file system. The file system provides the directory structure that organizes the user's operating system, application, configuration, and data files. A clean install proceeds as if the disk was brand new; there is no attempt to preserve information that is already on the disk. The operating system and applications will be installed fresh. Any data files that are required must have been transferred to another disk for storage and will be copied back later. The disk must first be partitioned and formatted. This is similar to preparing a large garden plot. Partitioning is similar to laying out footpaths and ditches for irrigation and drainage. This defines the size and shape of your garden. Formatting is similar to laying out rows or beds. These are sized according to the crops that you wish to plant. The Windows XP operating system can use one of two formats: The FAT32 file system records the position of files on the disk using File Allocation Tables and 32-bit addressing (FAT32). The New Technology File System (NTFS) uses a journaling system to record changes to the file system and a Master File Table (MFT) to record information about each file. NTFS is usually more reliable than FAT32 and incorporates security. Student Activity: The student course content includes the lab, Install Windows XP. To complete this lab, students will install the Windows XP using FAT32 on a 5 GB partition. The following equipment is required for this exercise; A computer with a blank hard disk drive and Windows XP Professional installation CD. 19 Instalacja systemu Podczas instalacji systemu Windows trzeba dostarczyć: Formatu waluty i daty Języka wprowadzania Nazwę użytkownika Nazwę firmy Klucz produktu Nazwę komputera Hasło administratora Ustawienia sieci Członkostwo w domenie lub grupie roboczej Slide 24 - Install the Operating System 5.4.3 Install the operating system using default settings When installing Windows XP, the installation wizard gives the option to install using typical (default) settings or custom settings. Using the typical settings increases the likelihood of a successful installation. However, the user must still provide the following information during the setup: Standards and formats that define currency and numerals Text input language Name of the user and company Product key Computer name Administrator password Date and time settings Network settings Domain or workgroup information When a computer boots up with the Windows installation CD, the Windows XP installation process starts with three options: Setup XP: To run the setup and install the XP operating system, press ENTER. Repair XP: To repair an installation, press R to open the Recovery Console. Quit: To quit Setup without installing Windows XP, press F3. For this section, use the Setup XP setting. Instalator tworzy konto administratora o nazwie „administrator” Zmiana tej nazwy konta pozwala zwiększyć jego bezpieczeństwo. Konto administratora wykorzystuje się rzadko, do celów konfiguracyjnych. Stworzenie fikcyjnego konta jako szablonu Bezpieczne hasła Minimum 7 znaków, wykorzystanie cyfry, symbolu, dużej i małej litery. Slide 25 - Create Administrator Account 5.4.4 Create accounts An administrator account is automatically created when Windows XP is installed. The default administrator account is named "administrator". For security purposes, change this name as soon as possible. This privileged account should only be used to manage the computer. It should not be used as a daily account. People have accidentally made drastic changes while using the administrator account instead of a regular user account. Attackers seek out the administrative account because it is so powerful. Create a user account when prompted during the installation process Unlike the administrator account, user accounts can be created at any time. A user account has fewer permissions than the computer administrator. For example, users may have the right to read, but not modify, a file. Teaching Strategy: Another common practice is to rename the default administrator account and then create a normal user account named administrator. The default administrator account cannot be deleted or locked out after multiple failed passwords like a normal user account. By recreating the account you can protect the system against attempts on the administrator account since the recreated account will lock out after multiple failed attempts. Slide 27 – Check Device Manager for Conflicts 5.4.5 Complete the Installation You should also verify that all hardware is installed correctly. You can use Device Manager to locate problems and to install the correct or updated drivers using the following path: Start > Control Panel > System > Hardware > Device Manager In Device Manager, warning icons are represented by a yellow exclamation point or a red “X”. A yellow exclamation point represents a problem with the device. To view the problem description, right-click the device and select Properties. A red “X” represents a device that has been disabled. To enable the device, right-click the disabled device and select Enable. To open a category that is not yet expanded, click the plus (+) sign. NOTE: When Windows detects a system error, Windows reporting displays a dialog box. If you choose to send the report, then Microsoft Windows error reporting (WER) collects information about the application and the module involved in the error and sends the information to Microsoft. Student Activity: The student course content includes the lab, Windows XP User Accounts and Updates. To complete this lab, students will create user accounts and configure the operating system for automatic updates after the Windows XP Professional installation process. The following equipment is required for this exercise; A computer with a new installation of Windows XP Professional. Poszukuj żółtych ikon oznaczających konflikty. Zbadaj szczegóły błędu. Kliknij znaj (+), aby rozwinąć kategorie. Niektóre błędy można zignorować. Narzędzie Microsoft System Preparation Kroki klonowanie instalacji: Stworzenie komputera-wzorca Uruchomienie programu Sysprep Stworzenie obrazu dysku za pomocą programu firm trzecich Skopiowanie obrazu na serwer. Uruchamianie komputera docelowego: Uruchamia się uproszczona wersja systemu operacyjnego Program konfiguruje tylko niezbędne elementy instalacji Plik odpowiedzi dostarcza informacji normalnie wprowadzanych przy instalacji Slide 28 - Custom Installation Options 5.4.6 Describe custom installation options Microsoft System Preparation Imagine trying to install operating systems in a large organization. Installing an operating system on one computer at a time can be a time-intensive activity. To simplify this activity, you can use the Microsoft System Preparation (Sysprep) tool to install and configure the same operating system on multiple computers. Sysprep prepares an operating system that will be used on computers with different hardware configurations. With Sysprep and a disk cloning application, technicians are able to quickly install an operating system, complete the last configuration steps for the OS setup, and install applications. Disk Cloning creates an image of a hard drive in a computer. Follow these steps for disk cloning: Create a master installation on one computer. This master installation includes the operating system, software applications, and configuration settings that will be used by the other computers in the organization. Run Sysprep. Create a disk image of the configured computer using a third-party disk- cloning program. Copy the disk image onto a server. When the destination computer is booted, a shortened version of the Windows setup program runs. The setup will create a new system security identifier (SID), install drivers for hardware, create user accounts, and configure network settings to finish the OS install. Test POST Test POST karta rozszerzeń, które go posiadają BIOS czyta Master Boot Record (MBR) MBR przejmuje kontrolę nad ładowaniem i uruchamia NT Loader (NTLDR) NTLDR czyta plik BOOT.INI i ładuje odpowiedni system operacyjny NTLDR wykorzystuje NTDETECT.COM do wykrywania sprzętu NTLDR ładuje NTOSKRNL.EXE oraz HAL.DLL NTLDR odczytuje pliki rejestru numeruje napędy NTOSKRNL.EXE uruchamia WINLOGON.EXE i wyświetla ekran logowania. Slide 29 - The Boot Sequence for Windows XP Identify the boot sequence files and registry files You should know the process that Windows XP uses when booting. Understanding these steps can help you to troubleshoot boot problems. Boot Sequence for Windows XP: Power On Self Test (POST) POST for each adapter card that has a BIOS BIOS reads the Master Boot Record (MBR) MBR takes over control of the boot process and starts NT Loader (NTLDR) NTLDR reads the BOOT.INI file to know which OS to load and where to find the OS on the boot partition NTLDR uses NTDETECT.COM to detect any installed hardware NTLDR loads the NTOSKRNL.EXE file and HAL.DLL NTLDR reads the registry files and loads device drivers NTOSKRNL.EXE starts the WINLOGON.EXE program and displays the Windows login screen The Windows XP Boot Process To begin the boot process, you first turn on the computer, which is called a cold boot. The computer performs the power-on self test (POST). Because the video adapter has not yet been initialized, any errors that occur at this point in the boot process will be reported by a series of audible tones, called beep-codes. After POST, the BIOS locates and reads the configuration settings that are stored in the CMOS. This configuration setting is the order in which devices will be tried to see if an operating system is located there. The BIOS boots the computer using the first drive that contains an operating system. Once the drive with the operating system is located, the BIOS locates the Master Boot Record (MBR). The MBR locates the operating system boot loader. For Windows XP, the boot loader is called NT Loader (NTLDR). Jeśli w pliku BOOT.INI jest więcej wpisów systemów operacyjnych, użytkownik może wybrać jeden z nich. W innym przypadku kontynuowana jest standardowa procedura ładowania. Slide 30 - NTLDR and the Windows Boot Menu 5.4.7 Identify the boot sequence files and registry files At this point NTLDR controls several installation steps. For instance, if more than one OS is present on the disk, BOOT.INI gives the user a chance to select which one to use. If there are no other operating systems, or if the user does not make a selection before the timer expires, then the following steps occur: NTLDR runs NTDETECT.COM to get information about installed hardware. NTLDR then uses the path specified in the BOOT.INI to find the boot partition. NTLDR loads two files that make up the core of XP: NTOSKRNL.EXE and HAL.DLL. NTLDR reads the Registry files, chooses a hardware profile, and loads device drivers. Teaching Strategy: A common source of NTLDR errors is from users leaving a non-bootable floppy disk or flash drive in the computer and the computer tries to boot from it. 26 Rejestr Jest podzielony na klucze oznaczone nazwami rozpoczynającymi się od HKEY_ Wszystkie ustawienia systemu są zapisane w rejestrze Zmiany w Panelu sterowania, powiązania plików, polityki systemowe są zapisywane w rejestrze. Każdy użytkownik ma swój wpis w rejestrze. Proces logowania systemu Windows przetwarza rejestr i przywraca stan z ostatniego logowania. Slide 31 - The Windows Registry 5.4.7 Identify the boot sequence files and registry files The Windows Registry files are an important part of the Windows XP boot process. These files are recognized by their distinctive names, which begin with HKEY_ followed by the name of the portion of the operating system under their control. Every setting in Windows—from the background of the desktop and the color of the screen buttons to the licensing of applications—is stored in the Registry. When a user makes changes to the Control Panel settings, File Associations, System Policies, or installed software, the changes are stored in the Registry. Each user has a unique section of the Registry. The Windows login process pulls system settings from the Registry to reconfigure the system to the state that it was in the last time that you turned it on. Następnie NT kernel, NTOSKRNL.EXE, przejmuje kontrolę nas systemem: Uruchamia pliki logowania WINLOGON.EXE Program uruchamia proces LSASS.EXE (Local Security Administration) LSASS.EXE program wyświetlający ekran logowania Jest kilka różnic miedzy logowaniem Windows XP oraz Windows 2000. Slide 33 - The NT Kernel and Security Authority 5.4.7 Identify the boot sequence files and registry files At this point, the NT kernel, the heart of the Windows operating system, takes over. The name of this file is NTOSKRNL.EXE. It starts the login file WINLOGON.EXE and displays the XP welcome screen. NOTE: If a SCSI drive will boot the computer, Windows will copy the NTBOOTDD.SYS file during installation. This file will not be copied if SCSI drives are not being used. Po instalacji systemu Windows XP można wykorzystać program MSCONFIG: Narzędzie pozwala na edycje i modyfikację plików uruchomieniowych systemu. Slide 34 - Manipulating Operating System Files 5.4.8 Describe how to manipulate operating system files After you have installed Windows XP, you may want to make changes to the configuration. The following applications are used extensively for post-installation modifications:: Msconfig: This boot configuration utility allows you to set the programs that will run at startup and to edit configuration files. It also offers simplified control over Windows Services. Rejestr to baza danych zawierających ustawienia sprzętu, oprogramowania i użytkowników. REGEDIT pozwala na edycje rejestru. Slide 35 - Manipulating Operating System Files 5.4.8 Describe how to manipulate operating system files Regedit: This application allows users to edit the registry. NOTE: REGEDT32 was used with Windows NT. In Windows XP, and Windows Server 2003, the REGEDT32 file is nothing more than a shortcut to the REGEDIT.EXE command. In Windows XP, you can enter REGEDT32.exe or REGEDIT.EXE; both commands run the same program. CAUTION: Using REGEDT32.exe or REGEDIT.EXE incorrectly may cause configuration problems that could require you to reinstall the operating system. Naciśnięcie F8 podczas procesu uruchamiania wyświetla zaawansowanych opcji uruchamiania. Tryb awaryjny – uruchamia Windows jednak ładuje tylko podstawowe sterowniki. Tryb awaryjny z obsługą sieci – uruchamia Windows w trybie awaryjnym, dodatkowo z komponentami sieciowymi. Tryb awaryjny z wierszem poleceń – uruchamia Windows bez ładowania GUI. Ostatnia znana dobra konfiguracja – Pozwala użytkownikowi załadować ustawienia konfiguracyjne od czasu ostatniego poprawnego zalogowania. Slide 36 - Manipulating Operating System Files 5.4.8 Describe how to manipulate operating system files You can boot Windows in one of many different modes. Pressing the F8 key during the boot process opens the Windows Advanced Startup Options menu, which allows you to select how to boot Windows. The following startup options are commonly used: Safe Mode – Starts Windows but only loads drivers for basic components, such as the keyboard and display. Safe Mode with Networking Support – Starts Windows identically to Safe Mode and also loads the drivers for network components. Safe Mode with Command Prompt – Starts Windows and loads the command prompt instead of the GUI interface. Last Known Good Configuration – Enables a user to load the configurations settings of Windows that was used the last time that Windows successfully started. It does this by accessing a copy of the registry that is created for this purpose NOTE: Last Known Good Configuration is not useful unless it is applied immediately after the failure occurs. If the machine is restarted and, despite its difficulties, manages to open Windows, the registry key for Last Known Good Configuration will probably be updated with the faulty information. 31 NTFS oraz FAT32 FAT32 jest używany kiedy pliku muszą być dostępne przez starsze systemy Windows. FAT32 nie jest tak bezpieczny jak NTFS. NTFS wspiera więcej i większe pliki jak FAT32 i zapewnia wsparcie dla bezpieczeństwa. Można skonwertować partycje z FAT32 do NTFS za pomocą narzędzia CONVERT.EXE. Slide 40 - NTFS and FAT32 5.4.9 Describe directory structures Windows XP and Windows 2000 use FAT32 and NTFS file systems. Security is one of the most important differences between these file systems. NTFS can support more and larger files than FAT32 and provides more flexible security features for files and folders. Partitions can be converted from FAT32 to NTFS using the CONVERT.EXE utility. Doing this will provide the extra security advantages of NTFS. To restore an NTFS partition back to a FAT32 partition, reformat the partition and restore the data from a backup. CAUTION: Before converting a file system, remember to backup the data. Student Activity: The student course content includes the worksheet, FAT32 and NTFS. To complete this worksheet, students will answer questions about the NTFS and FAT32 file systems. Ustawienia efektów wizualnych i pamięci wirtualnej Slide 51 – Performance Settings 5.5.3 Explore administrative tools To enhance the performance of the operating system, you can change some of the settings that your computer uses, such as virtual memory configuration settings. To change the virtual memory setting, use the following path: Start > Control Panel > System > Advanced > Performance area > Settings button. There are many different settings that can be configured in the Windows operating system. These settings can all be accessed through the Control Panel. Przechowuje informacje o instalacjach w celu łatwego usuwania programów Slide 52 - Add or Remove an Application 5.5.4 Install, navigate, and uninstall an application As a technician, you will be responsible for adding and removing software from your customers' computers. Most applications use an automatic installation process when an application CD is inserted in the optical drive. The installation process updates the Add or Remove Programs utility. The user is required to click through the installation wizard and provide information when requested. Add or Remove Programs Applet Microsoft recommends that users always use the Add or Remove Programs utility, when installing or removing applications. When you use the Add or Remove Programs utility to install an application, the utility tracks installation files so that the application can be uninstalled completely, if desired. To open the Add or Remove Programs applet, use the following path: Start > Control Panel > Add or Remove Programs. Add an Application If a program or application is not automatically installed when the CD is inserted, you can use the Add or Remove Programs applet to install the application. Click on the Add New Programs button and select the location where the application is located. Windows will install the application for you. Once the application is installed, the application can be started from the Start menu or a shortcut icon that the application installs on the desktop. Check the application to ensure that it is functioning properly. If there are problems with the application, make the repair or uninstall the application. Some applications, such as Microsoft Office, provide a repair option in the install process. You can use this function to try to correct a program that is not working properly. Uninstall an Application If an application is not uninstalled properly, you may be leaving files on the hard drive and unnecessary settings in the registry. Although this may not cause any problems, it depletes available hard drive space, system resources, and the speed at which the registry is read. Use the Add or Remove Programs applet to uninstall programs that you no longer need. The wizard will guide you through the software removal process and remove everything that was installed. Student Activity: The student course content includes the lab, Install Third-Party Software. To complete this lab, students will install and remove a third party software application by using the Microsoft Windows XP Professional Installation CD. Students will install the CITRIX ICA 32-bit Windows Client application. The following equipment is required for this exercise; a computer system that is using Windows XP and a Microsoft Windows XP installation CD. Ścieżki aktualizacji Slide 53 - Upgrading an Operating System Describe upgrading an operating system Sometimes it may be necessary to upgrade an operating system. Before upgrading the operating system, check the minimum requirements of the new operating system to ensure that the computer meets the minimum specifications required. You should also check the HCL to ensure that the hardware is compatible with the operating system. Back up all data before upgrading the operating system in case there is a problem with the installation. The process of upgrading a computer system from Windows 2000 to Windows XP is quicker than performing a new installation of Windows XP. The Windows XP setup utility replaces the existing Windows 2000 files with Windows XP files during the upgrade process. However, the existing applications and settings will be saved. Elementy planu konserwacji ochronnej: Aktualizacje systemu i aplikacji Aktualizacje programów antywirusowych Sprawdzanie błędów dysku twardego Kopie zapasowe danych Slide 55 - Preventive Maintenance Planning 5.6 Identify and apply common preventive maintenance techniques for operating systems Preventive maintenance for an operating system includes organizing the system, defragmenting the hard drive, keeping applications current, removing unused applications, and checking the system for errors. After completing this section, the students will meet these objectives: Create a preventive maintenance plan Schedule a task Backup the hard drive 5.6.1 Create a preventive maintenance plan The goal of an operating system preventive maintenance plan is to avoid problems in the future. You should perform preventive maintenance regularly, and you should also record all actions taken and observations made. Some preventative maintenance should take place when it will cause the least amount of disruption to the people who use the computers. This often means scheduling tasks at night, early in the morning, or over the weekend. There are tools and techniques that can automate many preventive maintenance tasks. Preventive maintenance plans should include detailed information about the maintenance of all computers and network equipment, with emphasis on equipment that could impact the organization the most. Preventive maintenance includes the following important tasks: Updates to the operating system and applications Updates to anti-virus and other protective software Hard drive error checking Hard drive backup Hard drive defragmentation A preventive maintenance program that is designed to fix things before they break, and to solve small problems before they affect productivity, can provide the following benefits to users and organizations: Decreased downtime Improved performance Improved reliability Decreased repair costs An additional part of preventive maintenance is documentation. A repair log will help you to figure out which equipment is the most or least reliable. It will also provide a history of when a computer was last fixed, how it was fixed, and what the problem was. Usługa aktualizacji automatycznych skanuje system w poszukiwaniu potrzebnych aktualizacji i proponuje lub instaluje je automatycznie. Usługa może samodzielnie pobierać i instalować aktualizacje przy następnym uruchomieniu systemu. Slide 57 - Automatic Updates Schedule a task If every maintenance task had to be scheduled every time it was run, repairing computers would be much harder than it is today. Fortunately, tools such as the Scheduled Task Wizard allow many functions to be automated. But how can you automate the update of software that has not been written? Operating systems and applications are constantly being updated for security purposes and for added functionality. It is important that Microsoft and others provide an update service. The update service can scan the system for needed updates and then recommend what should be downloaded and installed. The update service can download and install updates as soon as they are available, or it can download updates as required, and install them when the computer is next rebooted. The Microsoft Update Wizard is available at this path: Start > Control Panel > System > Automatic Updates Teaching Strategy: Starting with Windows XP the copy of Windows must be validated in order for updates to be applied. This is normally done automatically but it can be done manually at Many times if updates are not applying correctly it maybe necessary to manually validate Windows. Most anti-virus software contains its own update facility. It can update both its application software and its database files automatically. This allows it to provide immediate protection as new threats develop. 40 Punkty przywracania Jest to obraz aktualnych ustawień systemu operacyjnego. System można przywrócić do tego stanu po awarii. Narzędzie tworzenia punktów przywracania działa jedynie na systemie aparycyjnym i aplikacjach. Przed wykonaniem punktu przywracania warto przeskanować system pod kątem wirusów i złośliwego oprogramowania. Kiedy je tworzyć: Przed aktualizacją systemu Przed instalacją aplikacji lub sterownika Ręcznie co jakiś czas Slide 58 - Restore Point Schedule a task An update can sometimes causes serious problems. Perhaps an older program is in the system that is not compatible with the current operating system. An automatic update may install code that will work for most users but does not work with your system. Windows Restore Point is the solution for this problem. Windows XP can create an image of the current computer settings, called a restore point. Then, if the computer crashes, or an update causes system problems, the computer can roll back to a previous configuration. A technician should always create a restore point before updating or replacing the operating system. Restore points should also be created at the following times: When an application is installed When a driver is installed NOTE: A restore point backs up drivers, system files, and registry settings but not application data. To restore or create a restore point, use the following path: Start > All Programs > Accessories > System Tools >System Restore Windows 2000 offers the ability to create an emergency repair disk (ERD) that saves critical boot files and configuration information necessary to troubleshoot problems in Windows. Windows XP offers the same features with the Automated System Recovery (ASR) wizard. Although both ERD and ASR are powerful troubleshooting tools, they should never replace a good backup. A recovery CD contains the essential files used to repair the system after a serious issue, such as a hard drive crash. The recovery CD can contain the original version of Windows, hardware drivers, and application software. When the recovery CD is used, the computer will be restored to the original default configuration. NOTE: Anti-virus software should be run to remove malware before creating a restore point. Student Activity: The student course content includes the lab, Restore Point. To complete this lab, students will create a restore point and return the computer back to that point in time. The following equipment is required for this exercise: a computer system running Windows XP and the Windows XP installation CD. Narzędzia kopii zapasowej pozwalają odzyskać dane po awarii. Do tworzenia kopii zapasowej używamy wbudowanego narzędzia systemu. Należy stworzyć strategię tworzenia kopii zapasowych. Decide how often the data must be backed up and the type of backup to perform. Windows XP posiada mechanizm Volume Shadow Copying, który pozwala na tworzenie kopii nawet podczas pracy z plikami. Należy tworzyć kopię tylko plików zmienianych od ostatniej kopii zapasowej. Slide 59 - Backup the Hard Drive 5.6.3 Backup the hard drive Just as the system restore points allow the restoration of OS configuration files, backup tools allow recovery of data. You can use the Microsoft Backup Tool to perform backups as required. It is important to establish a backup strategy that includes data recovery. The organization’s requirements will determine how often the data must be backed up and the type of backup to perform. It can take a long time to run a backup. If the backup strategy is followed carefully, it will not be necessary to backup every file at every backup. It is only necessary to make copies of the files that have changed since the last backup. For this reason, there are several different types of backup. Wybrane pliki i foldery Tak Kopia Nie Różnicowa Wybrane pliki i foldery zmieniane od ostatniej kopii normalnej Przyrostowa Wybrane pliki i foldery zmieniane od ostatniej kopii przyrostowej lub normalnej Dzienna Wszystkie plików, które zostały zmodyfikowane określonego dnia Slide 60 - Backup the hard drive 5.6.3 Backup the hard drive A normal backup is also called a full backup. During a normal backup, all selected files on the disk are archived to the backup medium. These files are marked as having been archived. A copy backup will copy all selected files. It does not mark the files as having been archived. A differential backup backs up all the files and folders that have been created or modified since the last normal backup or the last incremental backup. The differential backup does not mark the files as having been archived. Copies will be made from the same starting point until the next incremental or full backup is performed. Making differential backups is important because only the last full and differential backups are needed to restore all the data. An incremental backup procedure backs up all the files and folders that have been created or modified since the last normal or incremental backup. It marks the files as having been archived. This has the effect of advancing the starting point of differential backups without having to re-archive the entire contents of the drive. If you have to perform a system restore, you would have to first restore the last full backup, then restore every incremental backup in order, and then restore any differential backups made since the last incremental backup. Daily backups only back up the files that are modified on the day of the backup. Daily backups do not mark the files as being archived. To access the daily backup utility on a Windows XP Pro system, use the following path: Start > All Programs > Accessories > System Tools > Backup. There are many types of backup media available for computers: Tape drives are devices that are used for data backup on a network server drive. Tape drives are an inexpensive way to store a large amount of data. The Digital Audio Tape (DAT) tape standard uses 4 mm digital audiotapes to store data in the Digital Data Storage (DSS) format. Digital Linear Tape (DLT) technology offers high-capacity and relatively high-speed tape backup capabilities. USB flash memory can hold hundreds of times the data that a floppy disk can hold. USB flash memory devices are available in many capacities and offer better transfer rates than tape devices. Student Activity: The student course content includes the lab, Windows Backup and Recovery. To complete this lab, students will back up a computer registry and perform a recovery of a computer registry. The following equipment is required for this exercise; a computer system running Windows XP. Nazwa firmy, nazwa osoby, dane kontaktowe Konfiguracja komputera System operacyjny, zainstalowane aktualizacje, środowisko sieciowe Informację należy zbierać na zleceniu Opis problemów Pytania otwarte Co było wykonywane kiedy problem się pojawił? Pytania zamknięte Czy jesteś obecnie zalogowany do sieci? Slide 62 – 1. Gather Data from the Customer Review the troubleshooting process The first Krok in the troubleshooting process is to gather data from the customer. This Krok allows the technician to evaluate the situation. The technician must organize the information about the customer and the reported problem. Often a work order is used to collect this information. There are two types of questions you can ask: open-ended questions and close-ended questions. Open-ended questions cannot be answered with "yes" or "no" answers. The purpose of open-ended questions is to allow the customer to describe the problem. Close-ended questions can usually be answered with "yes" or "no" answers. This type of question can help a technician focus in on an error and locate the exact problem once a potential solution is being tested. Examples of open-ended questions: What problems are you experiencing with your computer or network? What software has been installed on your computer recently? What were you doing when the problem was identified? What operating system do you have installed on your computer? What updates or patches have been installed on your computer? Examples of closed-ended questions: Has anyone else used your computer recently? Does the computer boot up successfully? Have you changed your password recently? Have you received any error messages on your computer? Are you currently logged into the network? When a customer is not able to accurately describe the problem, there are other ways to evaluate the situation in subsequent steps in the troubleshooting process. Użyj opcji Ostatnia znana dobra konfiguracja Sprawdź tryb awaryjny Odinstaluj niedawno dodane aplikacje Przywróć system do ostatniego punktu przywracania Sprawdź Manager urządzeń w poszukiwaniu konfliktów sprzętowych Uruchom narzędzia cleanmgr, chkdsk/f oraz defrag Zaloguj się na innego użytkownika lub ponownie uruchom komputer Slide 64 – 3. Try Quick Solutions First Review the troubleshooting process The next Krok in the troubleshooting process is to try quick solutions. If checking the obvious issues did not solve the problem, you should then attempt some quick solutions. As mentioned throughout this chapter, Windows XP has many features that are designed to repair common problems. For example, when you press the F8 key during the boot process, it will to bring up the Windows Advanced Options menu. This menu will provide several troubleshooting options, including "Safe Mode" and the "Last Known Good Configuration". The following are software tools that are built into Windows 2000 and XP that you should attempt as quick solutions: Use the F8 key during boot up to use the Last Known Good Configuration settings. Use the F8 key to enter the Safe mode to troubleshoot video problems. Uninstall an application that was recently added by using the Add/Remove program in the Control Panel. Roll back the system using a System Restore point. Examine the Device Manager for device conflicts. Run cleanmgr to clean up temp files. Run chkdsk/f to repair problems with the hard drive. Run defrag to speed up the hard drive. Reboot the computer. Login as a different user. It is not always possible to solve the problem with a quick solution. To proceed troubleshooting the problem, you will need to gather information from the computer. Może być potrzeba dalszego poszukiwania informacji Instrukcje serwisowe Dokumentacje produktów Strony internetowe producenta Rozmowy z innymi technikami. Zaimplementuj najpierw najbardziej skuteczne rozwiązania Przywróć komputer do pierwotnego stanu przed sprawdzeniem kolejnego rozwiązania Może być potrzeba sprawdzenia wielu rozwiązań przed naprawą problemu Slide 66 – 5. Evaluate Problem & Implement Solution Review the troubleshooting process Once you have gathered information from the user and conducted an inspection of the computer, you may need to conduct further research. Additional information can be obtained to help identify the problem. Reference repair manuals, study the product documentation, visit the website of the manufacturer, and consult repair journals to find similar problems and solutions. Finally, talk to other technicians who may have seen and repaired similar problems. When you identify a potential solution, implement the solution and test the results. Try the most likely solution first. Remember to return to the original state before continuing to the next possible solution. Often it is necessary to test many potential solutions before the problem is resolved. Examples of places to conduct research: Problem solving experience Other technicians Internet search News groups Manufacturer FAQs Computer manuals Device manuals Online forums Technical websites Teaching Strategy: Ask the instructors for stories of how they may have repaired something using an unusual method of research. Kiedy masz pewność, że problem jest już rozwiązany: Udokumentuj sprawę i wszystkie podjęte kroki na zleceniu. Wyjaśnij klientowi rozwiązanie problemu. Pozwól klientowi sprawdzić rozwiązanie. Wypełnij całość zlecenia. Uaktualnij dziennik napraw. Stwórz dokumentację potrzebną w przypadku przyszłych podobnych problemów. Slide 67 – 6. Close with the Customer Review the troubleshooting process When you are confident that the problem has been resolved, the next Krok is to close with the customer. The technician must completely document the customer contact information, problem description, and steps to resolve the issue in the work order. Explain to the customer each Krok that you took to solve the problem. The customer needs to understand what caused the problem in order to avoid similar kinds of problems in the future. Turn on the computer and let the customer verify that the problem has been solved. Finally, have the customer reboot the system and check for any problems. Complete all documentation. Make sure you fill out all internal documentation, such as sales orders, time logs, and receipts. A work order should be completed and the repair journal should be updated. You can use the notes from the journal for future reference and to build a knowledge database. Symptom Rozwiązanie Komputer wyświetla obraz w 16 kolorach po aktualizacji sterownika. Użyj opcji “Przywróć sterownik”, aby powrócić do starej jego wersji. System się nie uruchamia, pokazuje komunikat “Invalid systems disk”. Wyjmij wszelkie dyskietki i płyty CD z napędów i sprawdź czy dysk twardy jest pierwszym do uruchamiania systemu w BIOS. Komputer nie może ukończyć ładowania systemu Windows. Uruchom komputer w trybie awaryjnym i odinstaluj nowododane aplikacje. Slide 68 – Common Problems and Solutions 5.7.2 Identify common problems and solutions Operating system problems can be attributed to hardware, application, or configuration issues, or to some combination of the three. You will resolve some types of operating system problems more often than others. Other common problems and possible causes to consider: Problem: The computer displays the desktop in 16 color VGA mode after updating the video drivers. Possible solution: Use the “Roll Back Driver” option to remove the new video driver. Possible solution: Remove any unnecessary programs from the Startup tab and reboot the computer. Problem: The computer will no longer boot to Windows and gives the error “Invalid systems disk” Possible solution: Remove any floppies and CDs from the computer and verify that the HDD is set as a bootable device in the BIOS setup. Problem: The computer will not finish loading Windows. Possible solution: Boot the computer in safe mode and uninstall any recently installed applications. Pobierz ppt "Rozdział 5: Systemy operacyjne"
C++ w Objectivity Marcin Michalak s1744. Pomocne pakiety: Data Definition Language (DDL). Standard Template Library (STL). Active Schema. Tadeusz Janasiewicz IT Group, Tadeusz Janasiewicz, WSUS, IT Group, r.
KOLEKTOR ZASOBNIK 2 ZASOBNIK 1 POMPA P2 POMPA P1 30°C Zasada działanie instalacji solarnej. PROPOZYCJE ZAPISU Autorzy: Uczniowie należący do Samorządu Szkolnego. Czyli jak zrobić prezentację komputerową? Portal Systemu Jakości Kształcenia Jak się zalogować? Instrukcja dla pracowników UMCS Przygotowanie: Urszula Wojtczak, Zespół Obsługi Systemu Jakości Kształcenia. Propozycja siatki godzin Specjalność: Modelowanie i Programowanie Systemów Informatycznych. Autorzy: Agnieszka Kuraj Natalia Gałuszka Kl. III c.
Program wspomagający sekretariat Korespondencja. Wprowadzenie Instytucja dla którego ma być aplikacja pracuje w sieci Ethernet. Serwery pracują na systemie. Uniwersytet Mikołaja Kopernika Wydział Fizyki, Astronomii i Informatyki Stosowanej Podyplomowe Studium Programowania i Zastosowań Komputerów Autor: Marcin. Security & Communications Training Academy | Date 2011 © Robert Bosch GmbH reserves all rights even in the event of industrial property rights. We reserve.